Samples J.R. Funk & The Love Machine - 'Feel Good, Party time'. Some issues have a sticker on the sleeve with the CAT# varient XLT 20. This is an absolute belter of a track. Its a tale of 2 riffs; one part piano driven house that samples something very familiar although i cant think what it is, then after the "PARTY TIME" sample a full on techno assault with a slamming groove that would and would still have dancefloors in a frenzy today. Theres a lot to be said for some of these old rave tracks, the production may not be top notch, but the love that went into these tracks is evident - made by the ravers for the ravers. 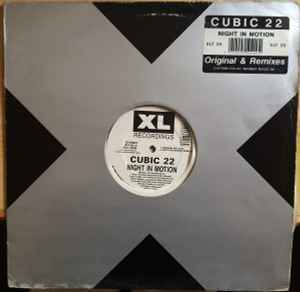 Cubic 22's "Night In Motion" figures among the most important XL Recordings releases all time and took its place as a true anthem on all the ravers minds from the early nineties to the old schoolers from nowadays. According to the highest English-rave tradition, you have an absolutely fantastic piano melodies after the violins on the drop - a landmark of that era (on the other side, you don't see much pianos or violin melodies on a single Techno tune this days - the purists won't admit it). The most shameful side of it lies on the fact that Techno and Breakbeats could (at that time, on the early nineties) promenade on the same walkside, and now it seems it just have to be 'straight' Techno or that 'Nu School Breaks'). Amazing experiences were felt by the Brazilian DJ Marky when he watched Carl Cox playing it in England recently - the crowd's reaction got him so deep that he reminded of his old days during his legendary residencies at Sound Factory Penha and Toco - when he changed the minds of a whole generation with "Night In Motion" on his repertories. The "Party Time!" sample comes from the 'J.R. Funk & The Love Machine - Feel Good, Party Time' Disco classic, from 1980.